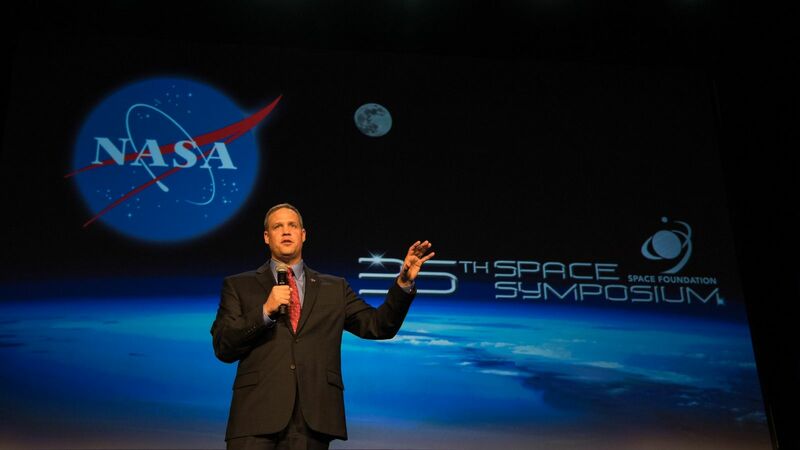 At the 35th Space Symposium in Colorado Springs, Colorado, NASA Administrator Jim Bridenstine discusses the agency’s plan to return humans to the Moon by 2024. Last month, Vice President Mike Pence challenged NASA to return humans to the Moon in five years. 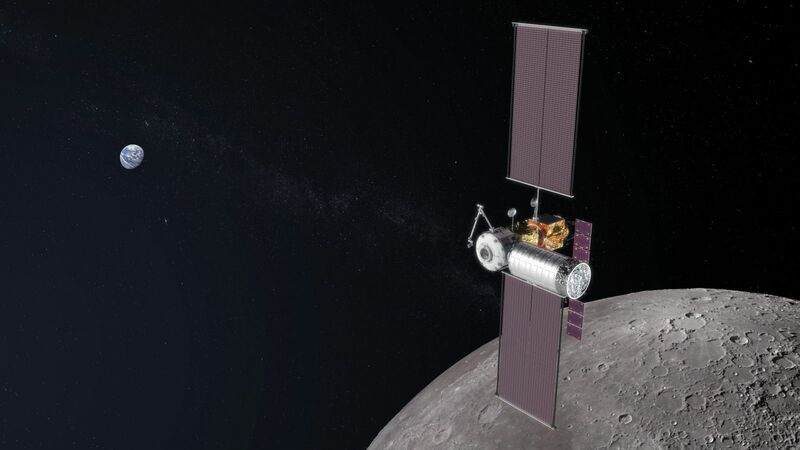 Since then, the agency has been working on a way to accelerate the plan it had already been working on to send people to the lunar surface by 2028. During the symposium, Bridenstine said the 2028 plan—based on President Trump’s Space Policy Directive-1—is the same, except certain elements will be shuffled around and accelerated. To accomplish that, the lunar goals have been divided into two phases. Phase one, Bridenstine said, is all about speed. He said if something isn’t needed to accomplish the goal of sending astronauts to the surface of the Moon by 2024, then it won’t be focused on. Bridenstine said the plan is to make sure Exploration Mission-1, the first full-up test flight of the long-delayed Space Launch System with the Orion capsule and European service module, happens in 2020. This is to be followed by EM-2, the first crewed flight, as soon as possible after. NASA said it is now targeting 2022 to fly that mission, which would involve sending four astronauts on a free-return trajectory, similar to the path that Apollo 13 took during its famous “successful failure” mission in 1970. That same year, the first element of the Lunar Gateway—a spacecraft NASA is calling a reusable command module located in a “near rectilinear halo orbit” (a highly elliptical orbit around the Moon) that will allow for not only a fast return to the lunar surface, but a sustainable one—is expected to launch. The Gateway’s first element, a power and propulsion module, is planned to be built by a commercial provider and orbited by a commercial rocket. The agency said it will use advanced solar electric propulsion. The other Gateway modules are likely to include docking compartments, habitat modules, an airlock and a robotic arm built by Canada. However, the final configuration is still being studied. What is known is that only the elements required for a fast return to the Moon are to be launched first. This likely means just the power and propulsion module and maybe a docking, or utilization, module. 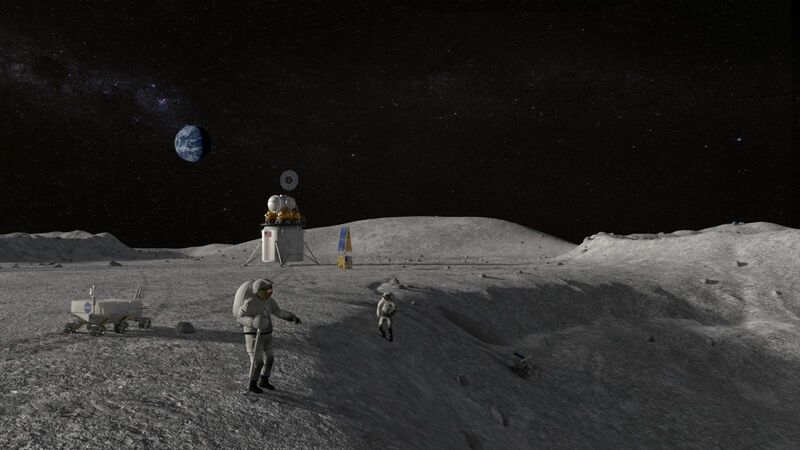 Meanwhile, starting as soon as congressionally possible, study contracts—and soon hardware contracts—are expected to be signed for the three stages of a human-rated lunar lander architecture. This includes a transfer vehicle to get to low-lunar orbit, a descent vehicle to get to the surface of the Moon, and an ascent vehicle to return to the Gateway. Except for the descent vehicle—at least initially—all of these elements are expected to be reusable and refueled by commercial companies. The goal is to use these pieces to land “the next man and first woman” on the Moon by 2024. But a lot has to happen before then, including convincing congress to supply the likely several additional billion dollars a year to accomplish this ambitions goal. The second phase is where everything else in the 2028 Moon plan will get pushed to. The rest of the Gateway is expected to be finished during this time frame, commercial cargo runs to the Gateway and even lunar surface are expected to be advanced as well. NASA hopes to be able to learn to use the Moon’s resources to manufacture oxygen, water and hydrogen as well in order to lessen the logistics required for Moon missions. Additionally, technology required for future Mars missions will be tested during phase 2 as well. “The Moon is a proving ground, it’s the best place for us to live and work on another world so that we can ultimately go to Mars,” Bridenstine said. If any of this sounds familiar, it’s because the agency used the same philosophy to split up work on the International Space Station once it was formally agreed upon in the early 1990s. For the ISS, phase 1 was about learning how to dock and live in space for long periods of time. 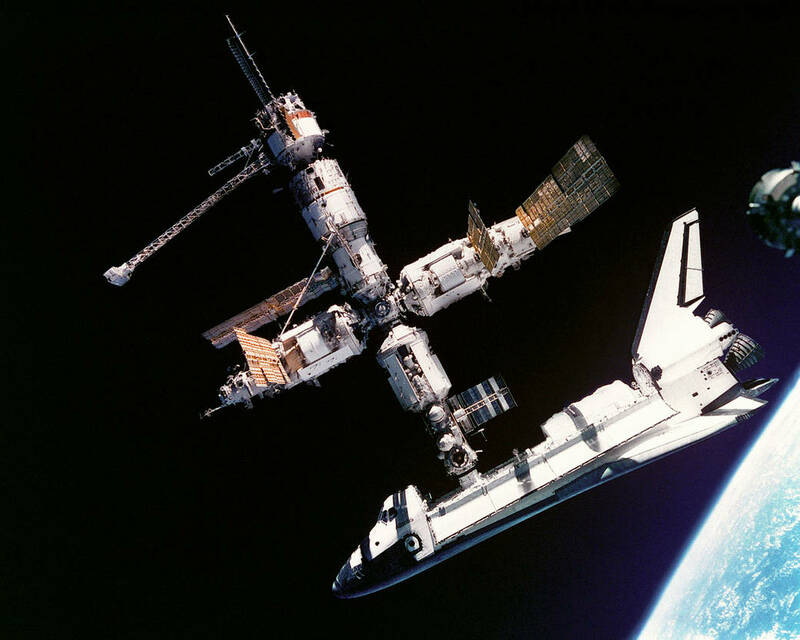 This was accomplished through the Shuttle-Mir program in the mid-1990s and involved shuttle dockings between 1995 and 1997 as well as several American astronauts staying aboard Mir for long periods of time. Phase 2 of the ISS program was the initial construction. According to NASA, it was meant to get the space station ready to support the first long-duration crews. This was completed once the first long duration crew arrived at the outpost in November 2000. The ISS has been continually occupied since then. The third phase was the complete assembly of the ISS. It was initially expected to be completed by the mid-2000s, but a combination of hardware delays and the Columbia accident in 2003—which prompted a 3.5-year halt to major construction—pushed the completion to 2011. Part of Bridenstine’s urge to get people back to the Moon is a personal and cultural one. He said he is the first NASA administrator to have not been born during the Apollo Moon landings. His first memories of space were of the Challenger accident, and later the Columbia accident.